Notes: Chilies that are straight are easiest to fill. Serve with Spanish rice made from a mix or favorite recipe. In a 2- to 3-quart pan over medium-high heat, stir cornmeal, 1 1/2 cups water, milk, 3 tablespoons butter, 1/2 cup corn, red bell pepper, and jalapeño until mixture bubbles and cornmeal no longer feels gritty, about 5 minutes. Stir 3/4 cup cheese and cilantro into cornmeal mixture. Let stand until just cool to touch. Season to taste with salt and pepper. About 1/2 inch below stems, cut tops crosswise off poblanos; save tops. With a fork, scrape out and discard seeds and pith. Holding a chili upright, spoon in cornmeal mixture, pushing gently with spoon and shaking gently to fill chili to rim. Replace poblano tops and secure with toothpicks. 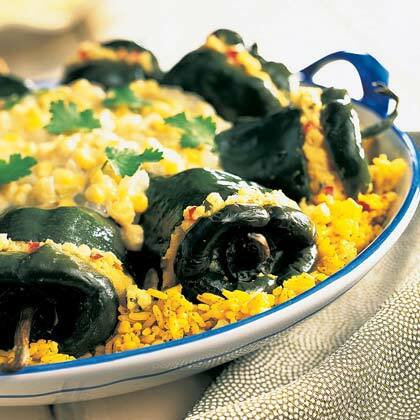 Lay poblanos on their sides in a shallow 10- by 15-inch casserole. Cover tightly with foil and bake in a 375° oven until chilies are tender when pierced, 40 to 45 minutes. Meanwhile, in a 1- to 2-quart pan over medium heat, frequently stir onion in remaining butter until limp, 8 to 10 minutes. Add canned chilies, remaining 1/2 cup corn, remaining 3/4 cup cheese, and half-and-half; stir until cheese melts, 1 to 2 minutes. Remove toothpicks from poblanos and spoon sauce over chilies. Add salt and pepper to taste.